Subhash Gupte was a kind of player who will always be remember for his great skills and magic of spin bowling. He is the first star spinner of India whose career unfortunately ended up due to strict action taken by India cricket board. Know more about this great player in this article. Subhash Gupte was a former Indian Test cricketer who was known for his excellent spin bowling skills. 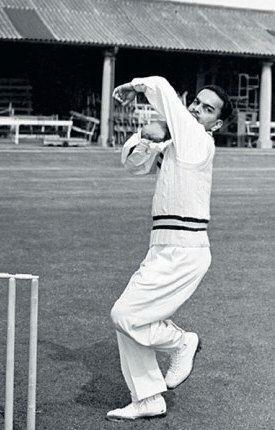 He was the front-line spinner of India in 1950s and early 60s. A little incident ended his career when he was only 32 and India lost a great spinner. He was born in Bombay (Mumbai) on 11 December, 1929. Subhash Gupte started his first-class cricket career by playing for MP Engineer's XI against MK Mantri's XI in a three day match in 1947. He took two wickets in that match. His next match came in 1948-49 Ranji Trophy match for Bombay against Madras but failed to impress with his bowling. In Ranji Trophy 1950-51, he took 6/55 against Maharashtra in their first innings and 3/93 in the second innings. He become the part of the Bombay Team for next two seasons. In 1952, Subhash Gupte played his first Test against England in third test at Eden Gardens, Calcutta. He remained wicket-less in that match. He got another chance in Tests against Pakistan at the end of the year and played in third and fourth test. He took five wickets in the third test. He also started to playing for Bengal in 1953. In 1953, when India toured West Indies, he played in all five Tests. In the first Test, he took seven wickets for 162 runs in West Indies first innings on a batting wicket. In second test he took 5 wickets in the defeat. He had his second five-wicket haul in the third test with a bowling figure of 5/107 in first innings of West Indies. In fifth and last match he took another five-wicket haul with a bowling figure of 5/180. He took a total of 27 wickets in five tests in that Test series. In 1954-55 tour of Pakistan he took 21 wickets in five tests with a bowling average of 22.66. He took three five-wickets hauls also. In first Test, he had a bowling figure of 5/18 in Pakistan's second innings. He continued with his form against New Zealand in 1955-56, when he took 34 wickets. In 1958-59 in a match against West Indies he merely missed to take all the ten wickets in an inning. His figures in that match were 9/102. It remained best bowling figure by an Indian in Test for long period until Kapil Dev broke that record with his figure of 9/83. Subhash Gupte has the second best bowling average(29.55) by an Indian bowler who has more than 100 Test wickets in their career, after Bishan Singh Bedi (28.71). Subhash Gupte's bowling figure of 9/102 against West Indies is the third best bowling figure by an Indian bowler in Test cricket. Read this article to know more about Abhinav Mukund who is selected as an opener for West Indies tour and making its contribution with Murali Vijay. He has played average cricket in West Indies but as far as his domestic records are concerned, he is very fabulous cricketer who got very good technique to handle fast bowlers. In this article I will explain biography and career profile of Indian Cricketer Abhinav Mukund. Prashant Parameswaran, Left hand medium pace bowler has proved his mettle with the first Match in IPL 2011 bagging Man of the Match Award. Parameswaran hailing from Thanneer Mukham, Aleppy in Kerala is a hard worker and with the support from cricket academies like TA Sekhar’s in Chennai, this guy can be moulded to a fine pace bowler. He will be an asset in a couple of years for Indian Cricket. This article gives you all information about Sachin Ramesh Tendulkar, best cricket player in the world. Check out this article as you can find Biography and profile of Sachin Tendulkar. This article also gives you details about Career records and awards won by Sachin Tendulkar in World Cricket. This article gives you all information about Virender Sehwag, one of the best cricket player in the world.You want to know more about Virender Sehwag Cricket career, biography,record and profile then read the full article.